Ok, it’s official, Saskatchewan birding is awesome!! I love being a new birder and learning all about neat birdy behaviours! There is so much to learn though. I was told today that I really need to travel up north and do some birding in the Prince Albert area. Also, that if I had a naturalist as a tour guide that would be helpful. I would love to do that in the future as I do love that area of the province, but I have to say that I think what we have going on in the immediate region around Regina is pretty darned awesome. For now, I am focused on seeing and learning all about the birds that are close to home. Here are some fun waxwing facts. Did you know that cedar wax wings sometimes get tipsy after drinking too many fermented berries? And, that they practically gorge themselves and clean off whole bushes at a time. AND, when courting, a male waxwing hops toward a female and gives her a berry, then after the female takes the berry hops away and then gives it back to male. Typical, women giving up the goods haha! Anyhow, amazing little birds. I love the look of the waxwings as they are so smooth looking – all except that little perfect tuft on top of their head. 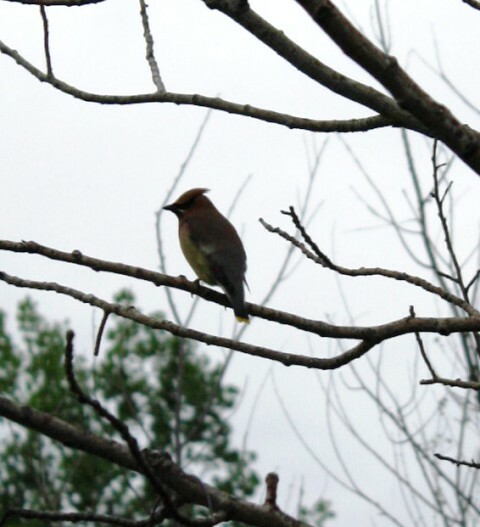 Speaking of waxwings, I cannot tell if the ones that I saw this weekend were Cedar waxwings or Bohemians, maybe you can. On a very positive note, the birds seem to be getting more used to me being there staring at them all day long, so perhaps by summers end, they will come even closer! In fact, I had a very close encounter with a hummingbird that came so close to my head that I jumped right out of my seat. Wow, they have a serious hummmmmm going on! I was able to get a few more shots this weekend, not great but better. My photos from the past weekend are below in this slideshow. I cannot express how great the birding is in Saskatchewan. I literally can spend the whole day spotting my new feathered friends even when I am in the comfort of my cabin.. En route to the cabin are many little bodies of water that play home to a lot of different ducks and shore birds, different from those we see at the cabin. Here is a short list of some new birds I spotted this past weekend. Hi Charles, I would love to bird all over the world if I could, perhaps someday. Saskatchewan is pretty much located in the centre of Canada, in the heart of the prairies. Totally different from where you are!